She said when digging began, local farmers told her they’d ploughed the field in their childhood, so she didn’t expect the site to be so well preserved. 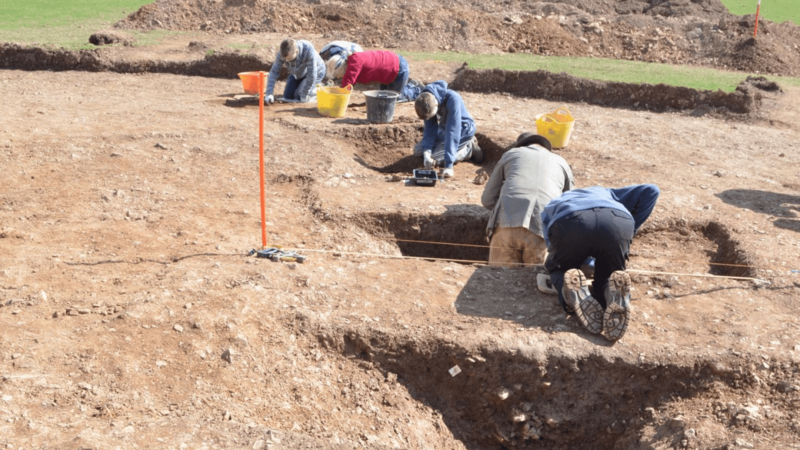 “We were so excited to find such a lot of archaeology on the site despite scores of generations of ploughing, but to find an intact clay urn buried 4,000 years ago just 25 centimetres beneath the surface is nothing short of a miracle,” said Dr Frieman. “This is a sealed, intact cremation so it has the potential to tell us a lot about the cremation rite as it was practiced 4,000 years ago. We also appear to have some identifiable fragments of bone among the cremated remains so we’ll potentially be able to tell a lot about the individual themselves,” she said. “We’ll be able to say what gender they were, possibly their age, or an age range, and depending on the bone preservation we can conduct analyses to examine where they were from, what their diet was like, where this food was coming from and what they ate and drank as a child when their teeth were forming. This is a very beautiful, very complete burial, and we’re very excited,” she said. “Hundreds of years after the barrow was built, someone from the 12th or 13th century came back to this site and dug into it to bury this pot. “At that stage there were two local monasteries in view of this site, as Looe Island was a satellite monastery of the Glastonbury Abbey, so it would be very strange to have non-Christian activity on this site. The evidence looks quite ritualistic, but what the ritual was, we don’t know,” she said. The team also excavated a round house – an ancient dwelling or land marker nearby, possibly from 500 BC and are trying to deduce possible reasons for the location of the barrow.